John King, 88, of Coaldale, died Saturday in Nesquehoning. He was the husband of the late Suzanne (Yurick) King. Prior to retiring, he had been employed as a printer, working for Avery Labels in New Brunswick, N.J.
Born in Coaldale, he was a son of the late Anthony and Mary (Millen) King. 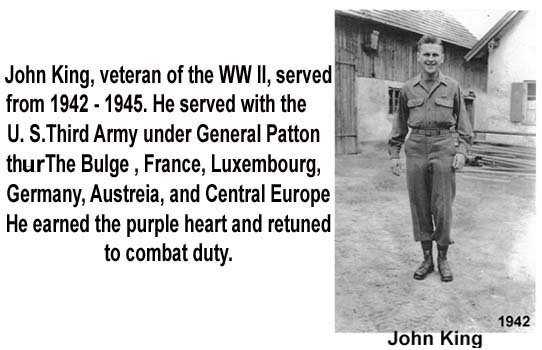 A veteran of World War II, he served in the U.S. Army, with Gen. George Patton's 702nd Tank Brigade, in the European Theater of Operations. He was a member of St. Mary's Russian Orthodox Church, Coaldale, where he served on the church council. A 1942 graduate of the former Coaldale High School, he also completed classes with the Dale Carnegie Institute. He was a member of the Coaldale Lions Club and the Russian Club of Coaldale. Surviving are a daughter, Pamela King of Wilmington, N.C.; a daughter in law, Janice King of West Chester; a nephew, Richard York of Coaldale; two grandchildren, Derek King and Alexandra Bilotta. He was also preceded in death by a son, John Charles King, who died in 1992. Services: 11 a.m., Wednesday, St. Mary's Russian Orthodox Church, Coaldale, with the Rev. Daniel Mathewson officiating. Interment, Sky View Memorial Park, Hometown. Call Tuesday, 6-8 p.m.,,Gulla Funeral Home, 130 E. Ridge St., Coaldale, or Wednesday, 10-11 a.m., at te church. Parastas Tuesday at 7 p.m. Contributions in his name may be made to the church. Online guestbook at www.zrgfuneralhomes.com.